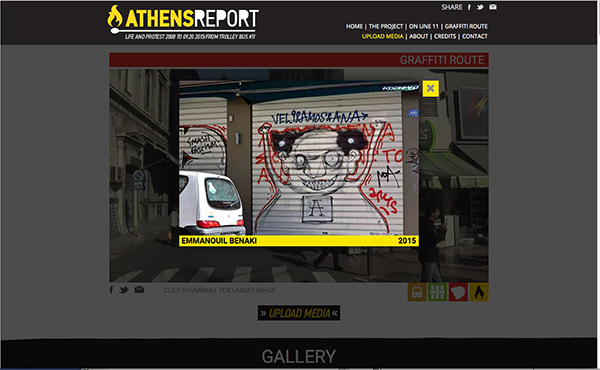 “Athens Report” is an interactive documentary and installation project, using digital media and the Internet to collect and archive interviews, video, photographs and graffiti of life and protest in Athens during theGreek debt crisis. a. The Greek debt crisis, its dire repercussions on Greek society, and the ongoing grassroots mobilizations against the austerity policies pursued by the government and the European Union. b. The rise of so-called “citizen journalism” and the challenges this has posed to the dominant representations of the Greek crisis through traditional media coverage. “Athens Report” addresses these dynamics by instigating alternative, bottom-up representations of the Greek crisis. Going beyond the spectacularization of social resistances to austerity and the aesthetization of the pauperization of large segments of the population that have dominated international media coverage, the project opens up the field of representation as an open-ended terrain of both contestation and cooperation. 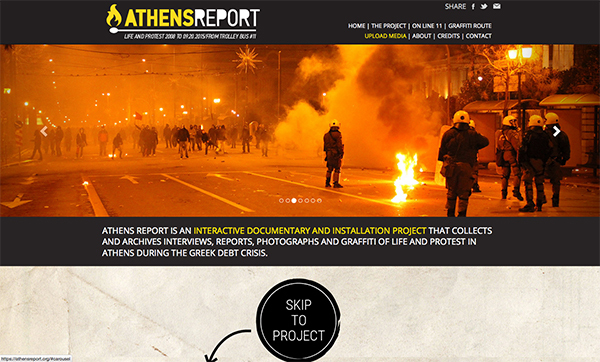 “Athens Report” creates a digital interactive platform that acts as both an archival tool and an ongoing documentary project. The digital archive produced by the “Athens Report” surfaces along the route of an old and popular trolley bus line, number 11, which runs through the historical center of Athens and connects two densely populated neighborhoods, Pagrati and Patissia. The trolley bus route and main navigation of the platform, mapped through a video shot by a camera mounted on a trolley bus, establishes the main topographical structure for the collection of audiovisual archives. The route of trolley bus number 11 is selected as the main video navigation of the platform because of the emblematic significance of the neighborhoods it traverses: passing through the center of the city, stopping at Syntagma square – the heart of the Greek 'occupy movement'- and the Greek Parliament, and then moving alongside luxury hotels and central bank offices, towards lower middle class and middle class districts that have been hit hard by the economic crisis and then onto poorer areas populated by a high percentage of undocumented migrants. As a unique archival platform, “Athens Report” offers a collective, distributed report of life and protest in Athens during the years of economic recession. The digital archive collects records of varying media (videos, photographs, texts, oral histories) representing events that have occurred in the past six years along the route of trolley bus number 11. 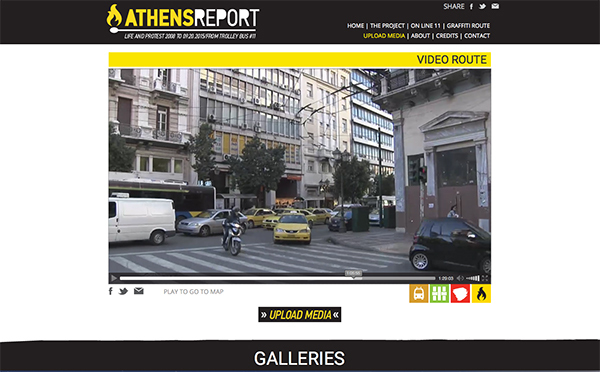 To accomplish this, “Athens Report” relies on a twofold strategy: a), it produces original material (interviews) from field research in selected areas along the trolley bus number 11 route and b) through its open call to producers of digital material, it collects and archives existing digital records that have been produced by citizen journalists. The galleries of audiovisual records accessible from this video journey offer new narratives of the contemporary political, economic, social and cultural history of Athenian society. These records, organized along the city’s streets, become active agents contributing to the viewer's formation of our collective perception of a period wracked by recession and resistance. Presented as an installation, “Athens Report” relies on two forms of accessibility of the platform simultaneously active in a space: a) a projection in physical space of the route of trolley bus number 11, the main video navigation of the platform, and b) accessibility of the platform’s galleries of audiovisual records via provided tablets and headsets. The idea is to engage multiple viewers in occupying the same space; and as they move and navigate through the audiovisual galleries individually yet connected within the projection space, their bodies will interact, forming a collective space of experience.